Banned Books Week 2016 is Sept. 25 through Oct. 1, 2016. Surprisingly, many of 2015’s most frequently challenged books aren’t particularly new — Looking for Alaska (2006), The Curious Incident of the Dog in the Night-Time (2004), and Fun Home (2007) are all around a decade old, and the Bible has been around for a few years too. One theme seems to be books on transgender issues. Two of the more recent titles on the 2015 list are books for children and young adults about what it means to be transgender — although they’re helpful for readers of any age who have questions. 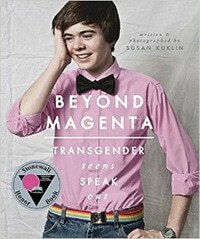 For further reading, the New York Public Library also has a good list of essential transgender books for teens. Check out these controversial books for Banned Books Week 2016! In this series of photo essays, author and photographer Susan Kuklin interviewed six transgender and gender-neutral young adults, using photos and their own words to tell their stories. Through candid photos, family portraits, and Kuklin’s own images, you’ll get to know each person’s individual story and their journey to recognition and acceptance of their true selves. If you’re trying to explain the concept of being transgender to someone who claims it’s just too confusing or difficult to understand, how about a picture book that is so simple it’s literally designed for small children? 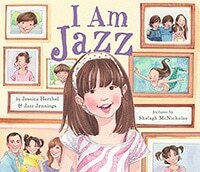 This colorful book tells the story of Jazz, who transitioned to life as a girl at age 5, and became a public figure when she was interviewed by Barbara Walters at a time when the transgender community was little-known to mainstream media. Jazz explains that she knew from a young age she was a girl in a boy’s body, and that her family was confused until they took her to a doctor, who explained that she was born transgender. This simple, straightforward story is a helpful teaching tool for classrooms, young readers, parents and teachers. For older readers, Jazz Jennings also has a memoir , released in 2016 (which will no doubt appear on a future Banned Books list). See the top 10 most challenged books of 2015. If you’re looking for #WeNeedDiverseBooks suggestions, this list of the most challenged books with diverse content is an excellent place to start. If it’s making people angry, it’s probably worth reading! Show your support with Banned Books Week swag. The 2015-16 List of Banned Books is just $1 and includes information on recent bans, challenges, and successes in libraries and schools nationwide.